All of the Port Orleans rooms feature either two Queen sized beds or one King size bed. Riverside’s Alligator Bayou section also features an extra pull-down Murphy bed (approx. 63" x 30") over the banquette bench seat, suitable for a child or small adult. Specially themed Royal Guest Rooms are available in Oak Manor and Parterre Place at Port Orleans Riverside. Please see the Guest Rooms page for further descriptions of the room amenities, photos and a detailed room plan layout. Effective for reservations made from 21 March 2018 onward, overnight car parking will no longer be the inclusive perk that it has been for resort guests at Walt Disney World for more than forty-five years. Self-parking at Port Orleans will now incur a nightly fee of $19, which will be applied to your hotel folio upon check-out. Theme park parking will remain “complimentary” for resort guests who have already paid the $19 fee, and self-parking at the water parks, Disney Springs and the ESPN Wide World of Sports remains free for everyone. Complimentary self-parking is also available to day guests and visitors who want to visit any of the Disney Resort hotels to experience the dining, shopping, entertainment, and recreation offerings. 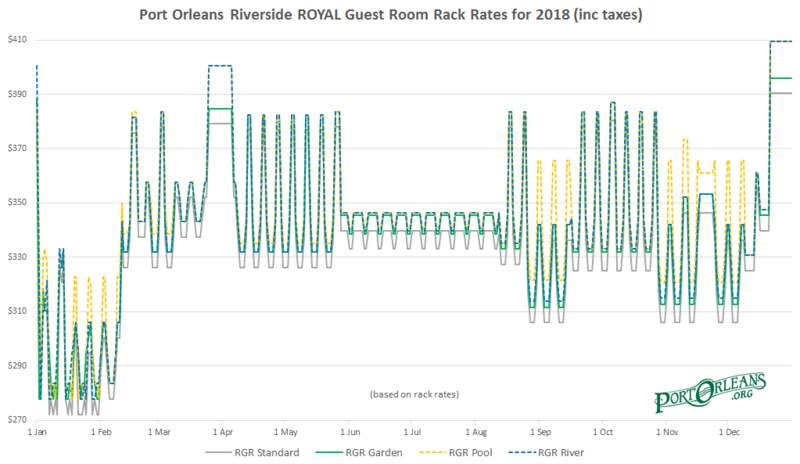 The USA ‘rack rates’ for Rooms and Packages in 2019 were released at 6am Eastern on 19 June 2018, roughly the same time that they have been issued for the past three years. You can now book rooms and packages with Disney online or via their telephone Reservations Center for 2019 vacations, up to the normal maximum of 499 days in advance. Other markets may vary (e.g. UK guests have been able to book their 2019 holidays since April). 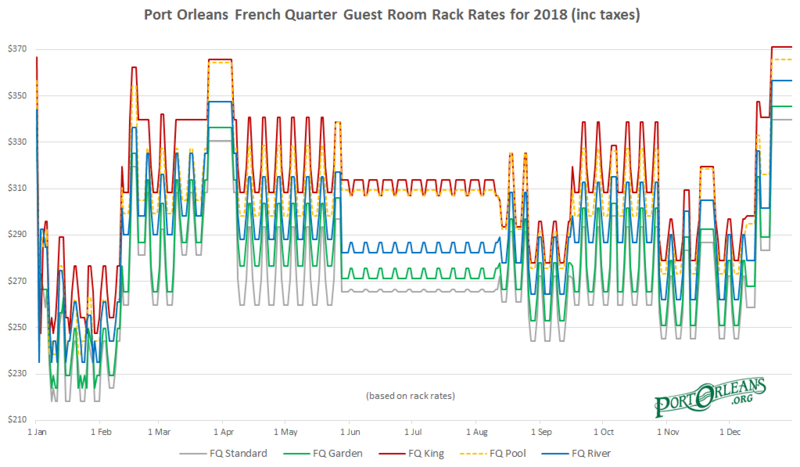 The USA ‘rack rates’ for Rooms and Packages in 2018 were released on Tuesday 20 June 2017, roughly the same time that they have been issued for the past two years. You can now book rooms and packages with Disney online or via their telephone Reservations Center for 2018 vacations, up to the normal maximum of 499 days in advance. 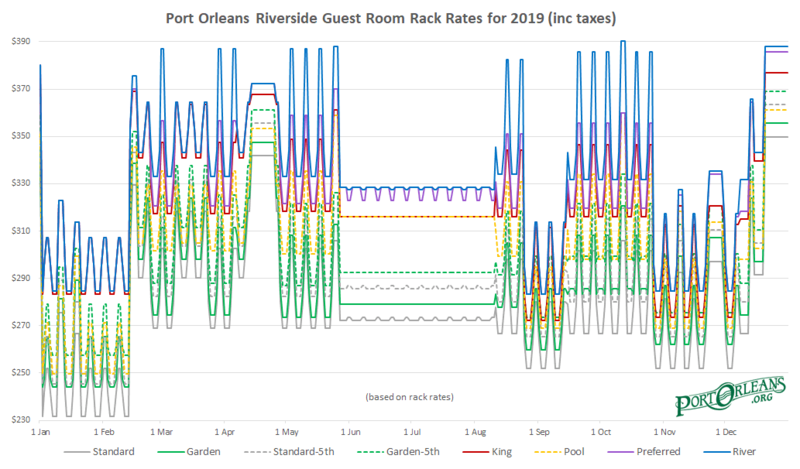 For the first time ever, the highest daily rates at Port Orleans — a ‘moderate’ resort — exceed $400 per night, which is over the Christmas period in a Royal Pool View or Royal River View room. Ouch! 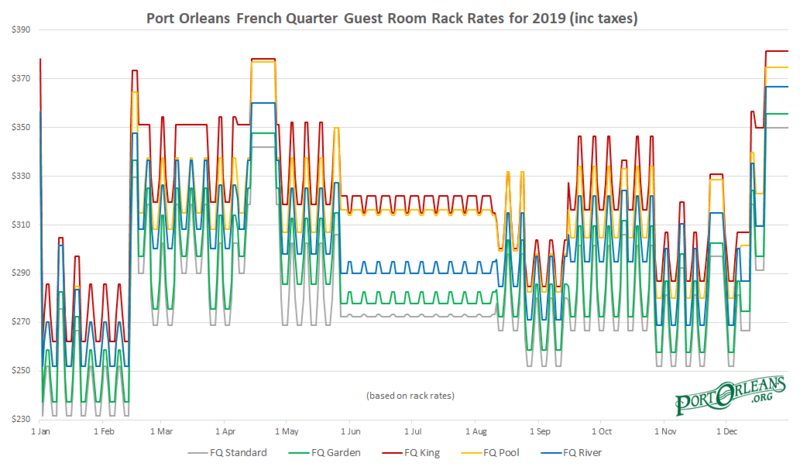 It looks like at French Quarter, King Bed and Pool Views are still considered the premium options now, way higher than River View. 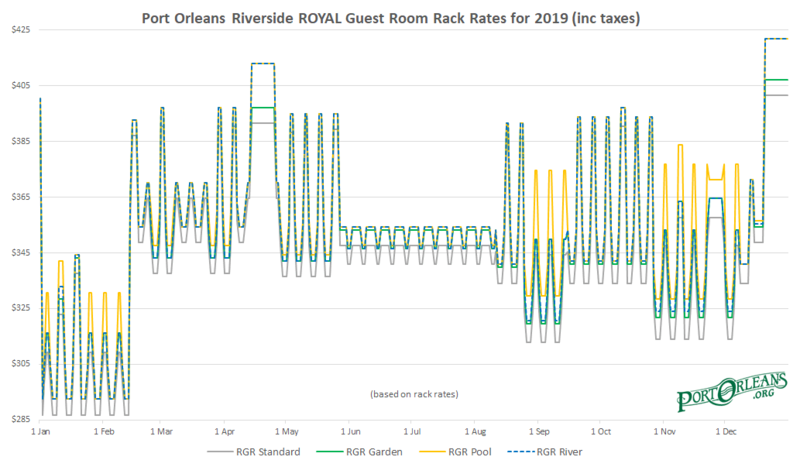 Also the variations within the four Royal Room categories often remain fairly minor, so if you’re planning on splurging on a Royal Room then you might want to consider the excellently-located Pool View, or River View, options. I’ve been having real difficulty trying to understand and differentiate the seasonal grouping blocks this year, as many of the blocks now seem to include up to three weekly price points (Monday, Tuesday & Wednesday being the cheapest, then Sunday & Thursday, and finally Friday & Saturday at a really hefty premium). This is what is causing all the wild fluctuations in the graphs below. Once I know the seasonal grouping dates I can create average weekly rates for each season type, which should make the graphs more readable and useful. 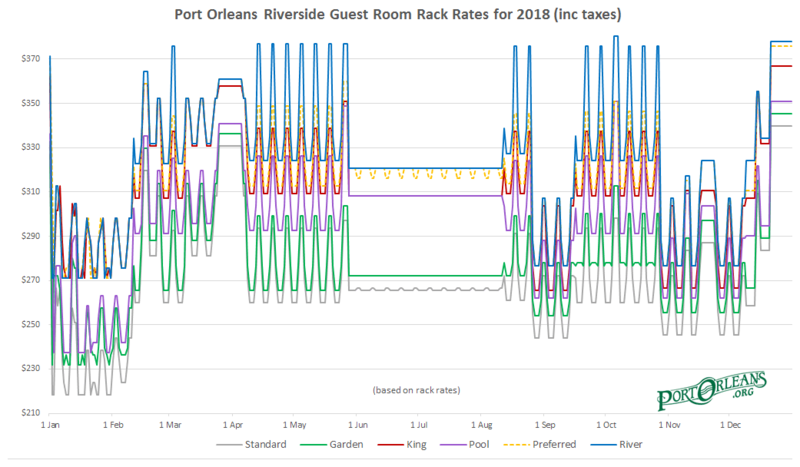 In the meantime, I’ve created a spreadsheet covering each of the fifteen room categories at Port Orleans for every day in 2018, which you can DOWNLOAD HERE. I did observe that some of the initial prices released on 20 June had changed two days later, so while that list is accurate as of 22 June 2017 there may be some further modifications over time. All of the above prices are based on Disney’s published “rack rates” — i.e. the rate you will be charged if you call the Reservation Center and are not entitled to any special discounts. Prices are quoted rounded to the nearest US Dollar, including 12.5% Florida resort tax. The total cost of your stay is calculated on a night-by-night basis, not as a block based on your arrival date. For many seasonal blocks, Monday, Tuesday & Wednesday are the cheapest nights, then Sunday & Thursday, and finally Friday & Saturday are the most expensive. Bookings can be made up to a maximum of 499 days in advance (although some international booking agents, such as The Walt Disney Travel Company in the UK, may offer longer periods). All rooms located within the Alligator Bayou section of Riverside feature an extra pull-down Murphy bed (child sized, approx. 63" x 30") located over the banquette bench seat and thus these rooms have a maximum occupancy of five people. No other areas within the resort have the option of an extra bed. The King Bed rooms within the Alligator Bayou section (only) also feature the same extra pull-down Murphy bed and thus these rooms have a maximum occupancy of three people. Around 50% of the resort’s rooms feature internal connecting doorways and this can be requested when you make your booking, although it cannot be guaranteed (unless one of the rooms contains only unaccompanied minors). Disney bases the room charge on up to two adults per room. For each additional adult (aged 18 or over) there is a $25 per night surcharge (used to be $15 until 2018). Additional children are free. Cots/cribs (Pack’n’Play) for the very young are available upon request. Children under the age of three do not count towards the maximum room occupancy, so technically you could have two adults, three children and an infant staying in an Alligator Bayou room — but it might be bit of a squeeze! Various types of Handicapped Accessible rooms are available throughout all sections of the resort, including some rooms modified for full wheelchair accessibility. See the Accessible Rooms page for more details. If you book directly with the Disney Reservation Center you will only pay a one-night deposit in advance, with the remaining balance due upon arrival. Cancellation for room-only bookings is normally available until six days before arrival (or 45 days for package bookings) but please check Disney’s Terms & Conditions for current details. Obviously if you make a travel agent reservation, or book via any other route such as Expedia, then their payment/cancellation rules will apply. Some discounts on the rack rates may be available, it never hurts to ask. For example, you can usually get a 15-20% discount for AAA membership, and Annual Passholder rates are also sometimes available (although they tend to sell out quickly once the dates are released by Disney). Disney sometimes offers one of their Dining Plans for free for each person staying in the room, but only with full-price room bookings that also include theme park tickets. These offers tend to be very limited for the Port Orleans resorts. For details of some current offers, please see our Discounts and Special Offers page. For further enquiries or to make bookings, please call 1-407-WDISNEY (1-407-934-7639) or book online via the Walt Disney World website. To review an archive of older historical room rates, please click here.